SABR is pleased to announce the 2019 recipients of the Henry Chadwick Award, established to honor the game’s great researchers — historians, statisticians, annalists, and archivists — for their invaluable contributions to making baseball the game that links America’s present with its past. 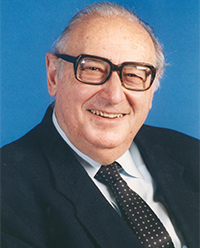 Leonard Koppett (1923-2003) was a long-time sportswriter known for his intellectual rigor and evidence-based analysis of the issues facing his two great sporting loves: baseball and basketball. 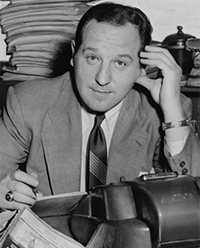 Born in Moscow but raised in the Bronx, Koppett wrote for many of the leading New York newspapers (Herald Tribune, Post, and Times) before relocating to the Bay Area and writing for several West Coast dailies. He also wrote a column for The Sporting News for many years. He authored 22 books on sports, including three highly influential baseball books: A Thinking Man's Guide to Baseball (1968), The Man in the Dugout (1993), and Koppett's Concise History of Major League Baseball (1998). He received the J.G. Taylor Spink Award from the Baseball Hall of Fame in 1992, and the Curt Gowdy Media Award from the Basketball Hall of Fame in 1994, and he remains the only writer to win both prestigious awards. Rob Neyer (1966 - ) is a baseball writer known especially for his facility with modern analysis and sabermetrics. Growing up near Kansas City, Rob was a devoted fan of the Kansas City Royals who caught his break when hired as a research assistant by Bill James. After four years with James and two at STATS LLC, Neyer’s full-time writing career began in 1996 when ESPN hired him and he became the first widely read, sabermetrically savvy writer on the Internet. Rob has written or co-written seven books, including the award-winning The Neyer/James Guide to Pitchers and, most recently, Power Ball: Anatomy of a Modern Baseball Game. By honoring individuals for the length and breadth of their contribution to the study and enjoyment of baseball, the Chadwick Award will educate the baseball community about sometimes little known but vastly important contributions from the game’s past and thus encourage the next generation of researchers. The criteria for the award reads in part: The contributions of nominees must have had public impact. This may be demonstrated by publication of research in any of a variety of formats: books, magazine articles, websites, etc. The compilation of a significant database or archive that has facilitated the published research of others will also be considered in the realm of public impact. For a complete list of Chadwick Award winners, click here. This page was last updated February 12, 2019 at 12:25 am MST.